We endeavour to provide as many sporting opportunities, for all of our children, as is possible in a one form entry Primary school. We have great links with Hampton Sports Club, along with the Lode Heath Sports Partnership, and are looking all the time at how we can enhance our provision. Children from George Fentham have been competing over the last 12 months in various competitions (Netball, Basketball, Cross Country, Gymnastics, Mini Golf and many more) as part of the Sainsbury's School Games. 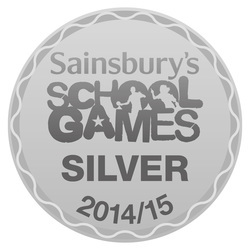 We are really pleased to have been awarded a Silver medal for our endeavours in 2014/15. Within the village of Hampton in Arden we are fortunate to have a fantastic Gym and Health Club facility. Instructors from The Hampton have been in to school on a number of occasions to support with raising the profile of sport and fitness, as well as helping us raise money (see below).